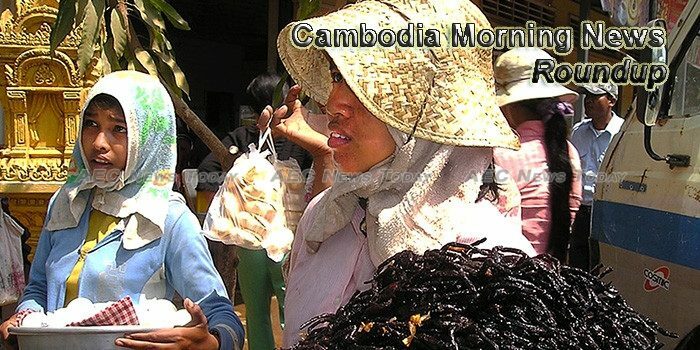 Cambodia’s economy is expected to grow by 7 percent in 2017 and 2018 despite disruptions due to “election-related uncertainty”, according to the International Monetary Fund (IMF). Cambodia’s market regulator has finalized regulations for establishing a corporate bond, moving one step closer to introducing a new capital market tool that would allow companies to raise funds for expansions, debt refinancing or acquisitions, officials announced yesterday. AS the biggest foreign investor in Cambodia, China is an all-around partner to the South Asian country, with cooperation ranging from the high-tech telecom network construction to specific agricultural technique for modern farming. Japan will use next week’s state visit by Prime Minister Hun Sen to offer $35 million in grant aid for a flood protection program in Cambodia and improvements to Phnom Penh. A Koh Kong environmental official yesterday said a company with a sand-washing facility in an area where the Ministry of Mines and Energy last month banned sand dredging would be allowed to keep and operate its facility. For Cambodian organic farmer Por Koung, the journey to Bangkok was more than just a chance to exhibit his products at an international expo, it was an opportunity to glean some experience from fellow organic farmers in Thailand, a country that is spearheading the region’s commercialisation of organic agriculture. The Maybank Silk-Weaving Training Centre held its second graduation ceremony yesterday in Takeo province, with 25 female weavers who completed the free training programme moving on to join Color Silk, a social enterprise that supports women engaged in home-based silk production. Banteay Meanchey provincial authorities plan to create a new border crossing into Sa Kaeo to alleviate heavy traffic at the Poipet checkpoint and also offer migrant workers a new, legal passageway into Thailand. Japan has donated more than $1.2 million to the Khmer Rouge tribunal and urged the court to continue prosecuting controversial cases against Khmer Rouge leaders, after the court’s investigating judges proposed halting those proceedings for the “sole reason” of “lack of funding”. Malaysian telecom giant Axiata Group will likely divest stakes in its more profitable operations, including its Cambodian subsidiary Smart, as the company is projected to have a 7 percent year-on-year decline in earnings for 2017, according to PublicInvest Research. Neath*, 27, sits in the shade of her family’s small wooden hut in Cambodia’s Kampong Speu district, west of Phnom Penh. With her slight build and spindly arms, most observers would never guess that she had been kept as a slave for three years and forced to carry heavy bags of cement and sand. The long and occasionally bloody saga between Capitol Tours and its former drivers continued on Wednesday, as the two sides were summoned to the Phnom Penh Municipal Court as part of a civil case brought by the travel company.